Last week lawmakers in the North Carolina Senate took steps to restore the death penalty in our state. North Carolina hasn't conducted an execution since 2006 due to legal challenges meant to create a de-facto moratorium. 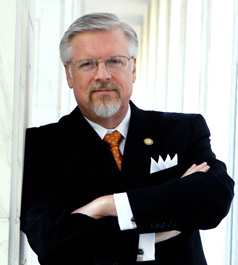 Sen. Thom Goolsby, the primary sponsor of SB 306 – Capital Punishment/Amendments, the bill which passed the Senate on Thursday, rightly argued, "We have a moral obligation to ensure death-row criminals convicted of the most heinous crimes imaginable finally face justice. Victims' families have suffered far too long. It's time to stop the legal wrangling and bring them the peace and closure they deserve." Goolsby stated the case quite eloquently, I believe. Yes, North Carolina has a moral obligation to proceed with executions. Despite the fact that death-row inmates receive super due process of law that accounts for an average of 12 years of appeals, and that there exists no solid evidence of even one innocent nationwide being executed in over a hundred years, anti-death penalty advocates have had the upper-hand in the Tar Heel state. Unfortunately, many of those who have led the charge against capital punishment have been people of faith. But quite frankly, I believe their contentions have wrongly focused on the supposed rights of criminals and not the injury of victims. Moreover, they demonstrate a poor handling of biblical exegesis, claiming the practice is immoral and rooted in revenge. When I hear clergy argue against the death penalty I question if they understand that retribution is the primary purpose of the law, not rehabilitation, not even deterrence to criminal acts. The purpose of the law is to exact a penalty proper to the crime. A just God requires a broken order in the Universe be restored. Even Christ's death for the sinner was based on the need for retributive justice to satisfy the legal demands of a Holy God, whose law requires, "The wages of sin is death" (Rom. 6:23). Christ affirmed retributive justice by His own death on the cross. For the Bible declares, "While we were yet sinners, Christ died for us" (Rom. 5:8). The concept of retribution is a bedrock principle necessary to understanding justice. This is a good example of the poor kind of biblical exegesis about which I was writing earlier. There is nothing in this text that advocates Jesus was condemning the death penalty. In fact, we should understand that no one had a deeper respect for the law than Jesus. He kept both the spirit and the letter of it. And even when it appeared to some he was not scrupulously keeping the law, it always turned out that Jesus was correcting an improper interpretation of it. In the case of the woman caught in adultery, the scribes and Pharisees were not correctly applying all of the Law of Moses. The law required in such cases that more than one witness was necessary to invoke the death penalty (Deut. 17:6; 19:15), but the text provides no certainty as to the identity of the witness or witnesses. There may have been only one witness, thereby making the execution illegal. The law also required both the man and the woman be executed (Deut. 22:22). Yet the man was never brought forward. Therefore, obedience to the law in this instance would require releasing the woman. Moreover, the entire episode was simply a trap these religious leaders had set for Jesus. Their very objective was to get Jesus to repudiate the Law of Moses in some way so they could argue he was a false prophet. If Jesus had renounced the death penalty in this situation, he would have fallen into the trap these conspirators had set from him. Instead, however, he turned the trap on them and revealed the wickedness, the coldness, and the hypocrisy of their own hearts. 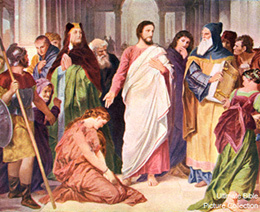 Later Jesus would ask the woman, "Woman, where are those thine accusers? Hath no man condemned thee?" (Jn. 8:10). In other words, where are the witnesses necessary to condemn you for your crime? When the woman said there were none, Jesus responded saying, "neither do I condemn thee" (Jn. 8:11), which was not some blanket or comprehensive unwillingness to judge or condemn a serious act of law breaking, but an acknowledgement that technically, legally, there were no witnesses to establish her guilt and thereby pass sentence. There is plenty in this text to make the case against the sin of self-righteously accusing or condemning others of something for which we ourselves are presently guilty. However, there is nothing in this text that rightly asserts Jesus was repudiating the death penalty. To argue this way from the story of the woman caught in adultery, sadly, is to create a pre-text that essentially implies no person has the right to judge anyone for anything. Because everyone is guilty of some sin or crime, therefore, no one has any moral authority to discipline – to punish – to levy jail time – to impose a fine, etc. This, of course, would be absurd; nevertheless, this is exactly where the argument logically ends. Currently, there are over one hundred family members whose loved one was dreadfully murdered by an inmate on death row in North Carolina. While the family members of death row inmates get to visit them in prison, the family members of the victims will never get to see their loved one again. While family members of the victims may forgive the person who killed their loved one, the person who was killed never gets an opportunity to forgive. What's fair, compassionate, or loving about such circumstances? Indeed, a "disturbed equilibrium" in the Universe needs to be made right. God required the death penalty in the Old Testament, starting with Genesis 9:6. Jesus affirmed retributive justice by his own death on the cross. And the apostle Paul declared government "bears the sword" as "the minister of God" for good and is an "avenger who brings wrath upon the one who practices evil" (Rom. 13:4). Justice has been delayed too long. The death penalty is right – it's moral – it should resume.